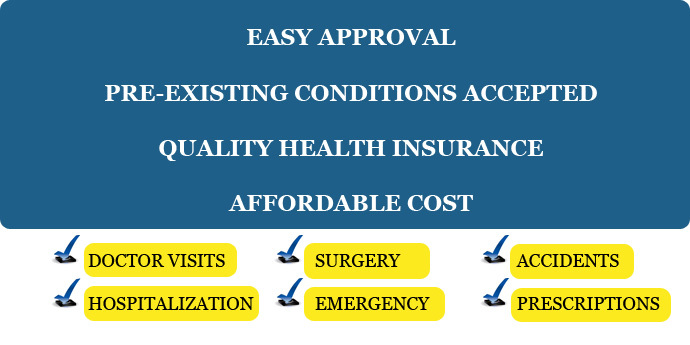 A major issue in healthcare and health insurance is that it is very difficult for an individual with a pre-existing condition to obtain a health insurance plan of any type for various reasons. This pertains to those who have cancer, diabetes, or any other long term condition.It is possible to obtain pre existing condition health insurance, but there are some problems with many companies that provide this type of pre-existing health insurance coverage. The majority of those health insurance companies will provide policy that excludes those pre-existing conditions, which renders the policy nearly useless. It’s best to speak with a Health Insurance agent to express your concerns about pre existing health insurance policies. Health insurance agents are licensed and trained to assist people in finding the proper insurance policy. Not only are there many personal factors you may not take into account during your search, but health insurance Agents have experience and inside information on various pre existing health insurance companies and plans that will help them find a perfect match for you. Pre existing health insurance is often known as Guaranteed Issue due to there being minimal or no requirements to qualify for the plan. As a fair warning, Guarantee Issue does not mean that your health conditions will not effect the price. Pre existing health insurance coverage is a great health option that will provide you with coverage and peace of mind. The most affordable type of family health insurance is an HMO. These family health insurance plans have a network of providers you must use; including primary care doctors, specialists, and hospitals, etc. While your family can utilize out-of-network services, they will not benefit from the discounted rates negotiated by the HMO health insurance plan. Also, you will generally have to see your primary care physician for non-emergency referrals to a specialist. HMO health insurance requires you and your family to trade some flexibility for convenience and cost savings. Some HMO networks are larger than others, so it is necessary to check beforehand whether or not your kids’ or spouse’s favorite doctor is in the network. VitalOne is here to provide you with affordable family health insurance. We will compare the rates and coverage of various health maintenance organization plans. PPO individual health insurance plans are similar to HMOs, except that they offer greater freedom. This type of family health insurance allows you and your family members to visit a specialist without receiving a referral from a primary care physician. In fact, you do not need to pick a primary doctor at all! A PPO plan includes a comprehensive network of health care providers, but any member of your family can choose one outside of the PPO network at a higher cost. While they remain an affordable family health insurance option, PPO plans usually come with higher co-payments, as well as a deductible, due to the increased choice they offer. At VitalOne, we can help you compare family health insurance plans from multiple providers. The point of service plan includes aspects of a PPO and an HMO. Although it requires your family to select and receive referrals from primary care physicians, they can then be referred to any specialist–regardless of whether or not they are in the POS plan’s network. This makes POS family health insurance plans more affordable than similarly flexible offerings. However, receiving out-of-network services can reduce its convenience. You and your family must submit claims yourselves, in order to receive the lower reimbursement rate. Health savings accounts are an option for many seeking affordable family health insurance. Premiums with HSAs are usually lower than those of other types of family health insurance. This is because HSA plans are combined with high-deductible health insurance plans. HSA plan accounts are tax-exempt, and can be used for minor out-of-pocket health expenses, such as over-the-counter and prescription medications, doctor visits, and hospitalizations. HSA family health insurance transfers more of the control and responsibility for family health insurance plans to you. Healthy families may benefit from health savings accounts, if your increased out of pocket expenses are less than their savings on premiums. Ask VitalOne to help you choose from the best HSA family health insurance plans. If you or any member of your family has a pre-existing medical condition, family health insurance is not unattainable. Guaranteed issue family health insurance plans are required to cover anyone who applies, regardless of health status. People with cancer, diabetes, high blood pressure, or currently pregnant are among those who can benefit from buying family health insurance with pre-existing conditions. Premiums are typically more expensive than standard plans, but can still serve as affordable family health insurance for those who need it most. Guaranteed issue family health insurance plans are available nationwide. Depending on the state you and your family live in, all family health insurance sold may be guaranteed issue. These plans allow you to take advantage of Multiplan and other comprehensive PPO networks like Multiplan. This allows your family to save you money when in-network providers are used. Compare guaranteed issue family health insurance with VitalOne today. If you are supporting a family, life insurance is essential. It pays out a specified lump sum upon an individual’s death, allowing them to care for their family after their passing. There are three typesof life insurance are term life, whole life, variable life, and universal life. Term life insurance is the most affordable because it only includes coverage for a set time period, usually anywhere from one to 30 years. Face value amounts for term life insurance policies range from $5,000 to over $1 million. How much life insurance do you need? That number depends on several factors. A life insurance policy should cover at least several years of your annual income. Higher incomes mean greater impact on your loved ones’ financial well-being after they stop coming in. If you have a significant amount of credit card debt, loans, or mortgages, you may also want to take those into account when deciding on the amount of your life insurance policy. It is also important that the monthly premiums for your life insurance policy are affordable. VitalOne is there for you during this complex process. Our licensed insurance brokers can help you select the right life insurance plan for your family’s needs. Critical illness insurance pays out a lump sum if you or a family member experience a major medical condition covered in the policy. Diseases, surgeries, and injuries included in typical critical illness insurance policies range from cancer (whether or not it has spread), heart attacks, organ transplants and strokes to severe burns, paraplegia, blindness, or deafness. Family health insurance does not always pay for all of the costs associated with a critical illness. When someone in your family is transported to a distant hospital that specializes in certain types of treatment, the payout received from critical health insurance could pay for family to travel there during hospitalization. The money can also be used to reduce your family’s stress; as mortgage payments, for example. Several conditions can be bundled together in one family critical illness insurance policy. A certain percentage of the coverage can be paid out upon initial diagnosis, while more can be paid in the case of a recurrence or developing another condition. The younger the members of your family are, the more affordable critical illness insurance is. You must be aware of what conditions are excluded, and how long the waiting period before receiving payment is. Similar to buying a life insurance policy, the amount of coverage you should get depends your family income and outstanding debts. VitalOne can help you decide which critical illness insurance policy is right for you. There are two main types of accident insurance: accidental death and accidental death and dismemberment (AD&D). The former covers your or a family member’s death if it directly results from an accident (e.g. a car crash); it does not cover health-related deaths. AD&D coverage also pays out upon serious injuries that are specified in the policy. Family accident insurance is available in higher amounts for a lower cost than standard life insurance because there is a smaller chance that a member of the family will die or be severely injured from an accident; therefore, insurance companies can afford to pay several times what you would expect. When selecting a policy, remember that most do not apply to any medical illnesses, drug overdoses, or surgical errors that lead to death. Accidental death insurance is meant to cover the higher cost resulting from a sudden death, including funeral expenses and emergency medical costs. Accidental death and dismemberment insurance normally pays out 50% of the policy upon losing one member (limb, hand, foot, or eyesight in one eye), with the full payout given upon an individual losing two members. The money will help pay for medical care and accommodations needed after the accident. It will also assist in providing for the rest of the family. Accident insurance can be purchased on its own, or as a rider added to any family health insurance or life insurance policy. VitalOne can explain the benefits and limitations of accident insurance policies and help you decide if an accident insurance plan is best for you and your family.